Marshall Publishing strives to create family-friendly media products that are both educational and entertaining. In business since 2007, Marshall Publishing creates DVDs, books, CDs, CD-ROMs, Internet programming, and award-winning 'As Seen On TV' products. Some of their products include videos about trains, penguins, and bridges. Historical materials include titles about Lincoln at Gettysburg, Lewis & Clark, and The Oregon Trail and Pony Express (just to name a few). They also have a title in Spanish. As a member of the crew I was fortunate enough to receive a copy of the LOTS and LOTS of FIRE TRUCKS and FIREFIGHTERS BOOK and SAFETY SONGS DVD. 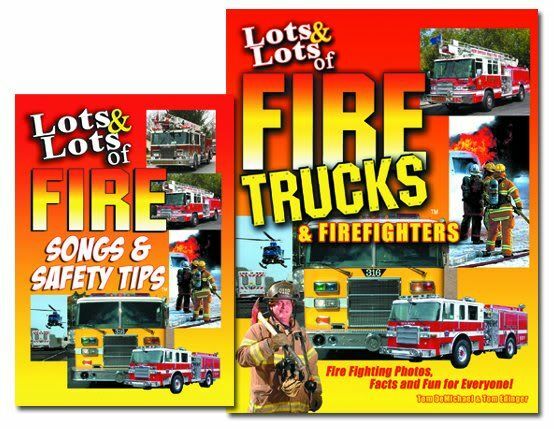 This combo packs features a 30 minute DVD filled with fire safety tips and playful songs as well as a 128 page Fire Truck book. This book was particularly impressive due to the many glossy color photos it contained. The DVD has an easily accessible menu that is divided up into two sections. The first section is an informative overview suitable for a presentation all about fire safety. The second part of the DVD is really where my kids were most interested. It contained songs and scenarios for them to learn from. As stated above, the book is quite impressive. It starts out with a lot of photos of all different types of firetrucks, including boat fire rescue and aerial vehicles. Another section profiles the fireman and talks about all different aspects of his job and duties. Fireman's alphabet, recipes of the fire hall, and many, many safety tips are also included. My favorite part of the book was the section devoted to the Greatest Fires in History. You can get this amazing bundle for only $29.95 on sale from $49.95! As an added and unexpected bonus I also received a new title from Marshall Publishing: George Washington Carver- His Life and His Work DVD. A newly released video, this is the heart warming story of how an uneducated poor person can achieve greatness. It is available on the website for a sale price of $19.95. As one of my blog readers you are entitled to a discount on these products at the Marshall Publishing website. Simply enter the code: TOSC1 at the checkout to receive 15% off the sale price! So what did my product testers think? I liked the fire truck part, but not the fire. I guess I liked that it was a DVD. The part I liked was the music. I really liked the part when it showed them building the firetruck and the '9-1-1 help Will Come' song.